Jaguar C-X17 debuts at Frankfurt Show with Meridian 3D sound system | What Hi-Fi? 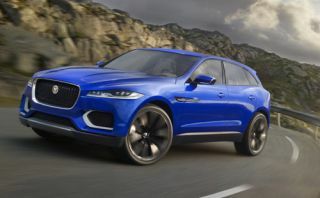 Jaguar's concept C-X17 SUV (sports utility vehicle), which was unveiled at the Frankfurt Motor Show this afternoon, features a 3D in-car surround system developed by Meridian. The British hi-fi specialist worked closely with Jaguar's engineers to develop the 28-speaker system for the prototype Jaguar C-X17's interior. It uses Meridian's Trifield 3D technology to create "3D surround sound" for everyone in the cabin. Speakers are integrated into the car's A and B pillars to bring them up to passengers' ear height, while the subwoofer is set within the rear centre tunnel to provide "a more consistent and accurate bass response for all passengers", Meridian says. There are also four additional speakers set into the head restraints. "The all-new sonic architecure allows Meridian's DSP [Digital Signal Processing] to further exploit its full capabilities of delivering authentic, evocative and believable sound for everyone [in the car]," says Graham Landick, Meridian automotive programme manager. Meridian has already developed the in-car audio systems for the Range Rover Evoque, new Range Rover, Range Rover Sport and Jaguar F-Type. According to our sister site Autocar, the ‘sports crossover’ concept previews an upcoming new SUV that will become part of a range of other new compact Jaguars. We assume the production vehicle will be offered with the Meridian set-up when it goes on sale.